We are a family owned and operated General Contractor serving the greater Twin Cities metro area. Together, owners Bryan and Tracy Johnson, have more than 30 years experience in the construction industry. The vast majority of those years have been spent dealing specifically with insurance claims created from severe weather. Bryan and Tracy have become very analytical about the insurance industry and their lack of true evaluation and compensation. This is due to constantly making sure that the insurance company pays for everything that is damaged to your property, instead of allowing them to compensate you for a smaller amount that does not cover the damage to your property. Johnson Exteriors has proven to be one of the few Contractors that has the expertise to handle your insurance claim from start to finish. With Johnson Exteriors no project is too big or too small. 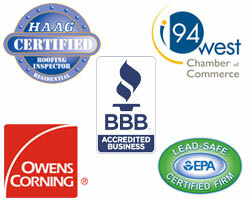 We look forward to showcasing our expertise and our experience to help you in any way possible. Call us and join the hundreds of other satisfied clients. We look forward to meeting the challenge!